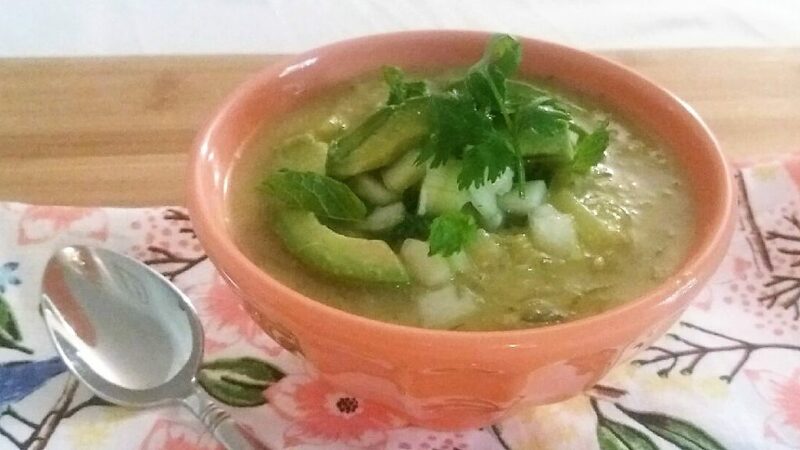 Vegan Zucchini Soup with fresh herbs is a perfect side dish that will help cool your metabolism to deal with the heat. Fresh mint and cilantro are naturally cooling, but if you have an aversion to cilantro you can add a touch of basil or double up on the mint. Cucumbers are also cooling, and they are balanced with a touch of ginger to add a spark of flavor while helping digest the cucumbers. Cucumbers are much easier to digest when peeled and seeded as well. Cumin and coriander aid digestion by balancing agni, the digestive fire, and add a subtle layer of flavor that can perfect many vegetarian dishes. I started the soup with a base of chickpea flour as a thickener. It adds a protein boost to the dish while its taste is quite neutral, particularly when the spices and herbs are added. Stay cool this summer with cooling Zucchini Soup—a dish with a surprising mélange of flavors for your summer menu. Please forgive my being a food snob, but I don’t suggest using a canned or boxed stock in my recipes. Anyone who has tasted my cooking and tries to replicate a dish using a commercial stock will always call me, whining, saying it doesn’t taste as good! If you don’t have 10 minutes to put a stock together, even a day before making this dish, I do suggest the following: Use water only; add ¼ teaspoon of ground turmeric and extra salt for flavor. 1. Heat the soup stock and water in a sauce pan. While the stock is heating, peel and dice the shallot. Chop the fennel. 2. Place a 5- or 6-quart soup pot on the stove and heat the oil on medium heat. Add the cumin seeds and leeks, and cook them until the leeks start to turn golden. Stir frequently, as the seeds can burn easily. When the leeks are ready, add the coriander and stir. Add 2 tablespoons of the chickpea flour and stir; immediately add ½ cup of the hot stock, and whisk. Continue adding flour and hot liquid, a little at a time, whisking out lumps until all the flour and liquid have been mixed together. 4. While the soup is cooling, peel the cucumber, remove the seeds, and chop it into small pieces. Wash and chop the basil, cilantro, and mint. Peel and slice the avocado. When the soup is cooled, add cucumbers and fresh herbs to each bowl. Top each bowl with a few slices of avocado. Squeeze a generous portion of lime over each bowl, and serve.